In the vast world of domestic hardware and fixtures, you'd be hard pressed to find two things more perfectly designed for each other than the electrical plug and socket. Without each other, plugs and sockets are just spare parts in separate bins; but if you put them together, magic happens! It sounds sappy, we know, but when you and your sweetie are wearing this cute Plug and Socket Costume together, you'll feel that magic too! When talking about actual plugs and sockets, the “magic” we're talking about is really that modern electrical wonder, alternating current, which is a lot like love when you think about it. Both allow you to do things you previously couldn't have done without it, both can warm you up and make you feel tingly inside (although with electricity, you generally wanna avoid the tingly part), and both can blow up in your face if you don't treat them right. So, if a plug and a socket that fit perfectly do happen to find each other, they can channel that mystical electric love magic to light up their lives together! 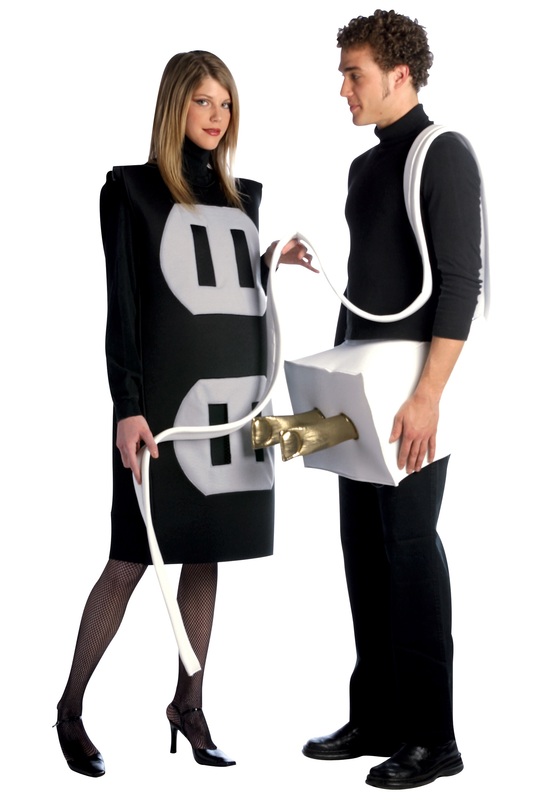 Now, when we're talking about the “magic” of the plug and socket in this couple's costume, all the stuff we just said still applies, except we're trying not to giggle while we say it. You and your special someone can wear these polyester and foam costumes to show everyone how perfectly you go together! Or, you can wear them to an electrician's convention and see how many awkward looks you can get from people. If that sounds like fun, then you two really are made for each other!